Sunflowers! 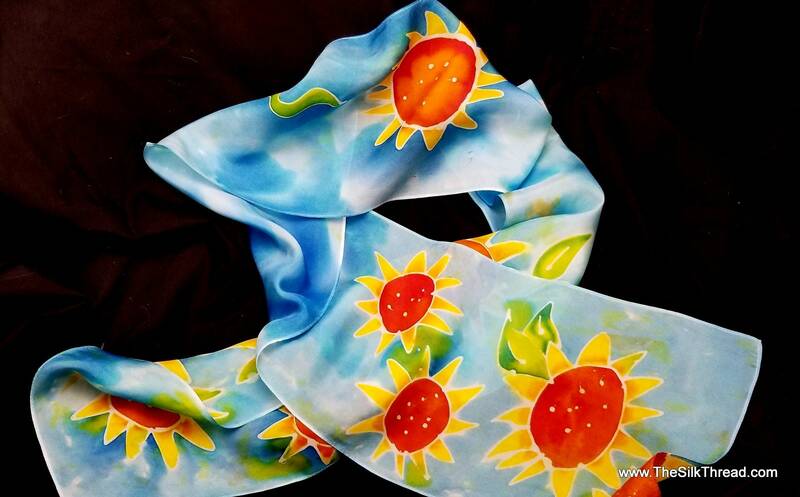 This is a unique one of a kind hand painted Silk scarf drawn in white resist then brought to life with sunflowers surrounded by a soft bluegreen. Bright and colorful. This 8" x 72" scarf is 100% pure silk. In many of my scarves I either hand draw the designs or I design and carve my own reliefs, build the blocks and print my designs onto the silk. The results are classic designs, beautiful colors and a one of a kind silk scarf. Each piece is hand painted and dyed by me, artist M Theresa Brown. Everything hand done here in my rural North Carolina studio! Hand wash in cool water and drip dry. Iron with pressing cloth if needed.